One of Ocala's premier cultural centers is the Appleton Museum of Art, located about 8 miles from the Holiday Inn & Suites - Ocala Conference Center. Click here for an interactive map to the Appleton Museum of Art powered by Google! The focal point of the Appleton Cultural Center, the Appleton Museum of Art was originally built to display and preserve the art collection of Arthur I. Appleton. Today the museum is part of a 44-acre complex which also includes the Ocala Civic Theatre and the Pioneer Garden Club. With 30,000 square feet devoted to gallery space, the galleries are arranged in a quadrangle which surrounds an interior courtyard and fountain. 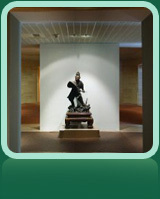 Visitors can view collections of art and artifacts from America as well as Africa, Europe, Asia and more. Many exciting traveling exhibits and special events are held throughout the year, including Art-oberfesta where guests enjoy an evening of song and dance in the courtyard. The Appleton is open Tuesday through Sunday and offers a variety of group tours. Visit the official website of the Appleton Museum of Art linked below for operating hours and current exhibit and event information. The Holiday Inn & Suites - Ocala Conference Center is the perfect choice for overnight accommodations when visiting the "Heart of Horse Country" - Ocala, Florida. Whether you are in town for business or taking a well-deserved vacation, our location is just two miles from Interstate 75 and is a perfect place for getting to all the sights and sounds of historic Ocala and Marion County, Florida.